“Don’t tell a soul there’s an ace up my sleeve / Just keep it between you and me,” sings prolific Athens, Georgia, singer/songwriter Daniel Aaron in the opening song of his latest project, Vespolina’s, self-titled debut record. True to form, the unassuming and self-effacing Aaron continues to up the ante with Vespolina, achieving a work of artistry on par with any of the most fashionable and celebrated releases of late. Where his former project, Timber, blended old time traditional instrumentation with country arrangements and a loose garage-pop feel, Vespolina presents well-crafted and delivered twangy pop featuring lush arrangements and Aaron’s signature wordplay. The resulting record, borne from the ashes of dissolved bands, struggling artists in a college town, and personal disasters, is riveting. Covering a wide range of sounds, tempos, and emotions, Vespolina is a mature and varied work. Kicking off with the upbeat, punchy “Between You & Me” the songs flow through the slow-rolling, heavy sound of “Pins & Needles”, reminiscent of an electric take on Gillian Welch’s “Time (The Revelator)”; the breezy “The Song” (suggestive of a possible outtake from your favorite Wilco album); on to the harmony-laden highlight “Striking Distance”; the haunting, dark Pink Floydian organ of “Moan”; and onward to the rhodes piano driven, electric fuzz, and fiddle-colored ballad “Don’t Fail Me Now”. The record closes with the spoken-word echo, train engine chug, and noise swelling “I’ve Had Nights Like That!”, taken from Michael Stipe’s playbook a la R.E.M.’s New Adventures in Hi-Fi. Kaitlin Jones’ and Holly Belle’s floating, atmospheric harmonies are on show here, adding ethereal textures throughout the songs. Bonnie Prince Billy, Pernice Brothers a la The World Won’t End, Jackson Brown’s Late for the Sky, The National’s Alligator, and even Beach Boys Surf’s Up all come to mind amongst this record’s parts. Fittingly, lyrical and musical fragments and motifs carry over from one song to another, each track serving as a piece of a larger canvass- dark, yet deeply human. It is a record of powerful immediacy and no pretense. No longer colored with the harmonicas, banjos, or pedal steel common in Timber’s work, Vespolina channels emotion in indie rock fashion. Against a backdrop of thick organs, the electric crunch, fuzz, and reverb of guitars, sweet harmonies, the occasional tasteful blanket of horns, and the hard pulse of the rhythm section, Aaron delivers a heartfelt and memorable performance with a hint of Bill Mallonee in his vocal delivery. Ornamental sonic textures float inside a number of the songs, recalling the production work of Brain Deck. But Aaron’s at the helm here, recording and engineering the record at his Alysseum studio in Athens. The brights are accentuated, blazing, and the darks darker. Flagpole Magazine called Vespolina “a highly enjoyable listen… with a twinge of uneasiness.” That’s not entirely mistaken. 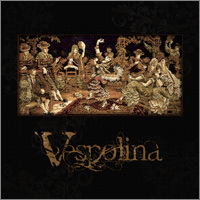 Vespolina’s intensity and thickness may be unnerving given a deep, close listen, but it’s a diverse and majestic collection that speaks truth. Like a nervous wreck presenting itself as being cool, calm, and collected, or a jigsaw puzzle thrown against the wall, and, somehow, surviving intact. In Vespolina there is hope. There is raw emotion and darkness, upbeat and slow. 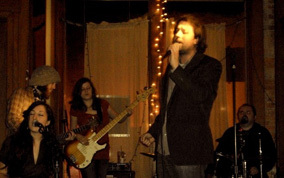 It’s about “a deeper need”, Aaron sings of his songwriting. The record faces the world and, unlike the magician of the first track, “Between You & Me”, offers no mirage, no trickery. Like a smokeless mirror, Vespolina reveals the world back unto itself. From the melancholy to the explosive, Vespolina charms and croons the ornate songs that will break your heart. 10. I’ve Had Nights Like That!